In a non-stick pan, sauté garlic and carrots in vegetable oil over low-medium heat. Add ground chicken sauté until half cooked and season with seaweed salt and pepper. Transfer chicken mixture in a small container and let it cool. Wrap in cabbage leaves and steam for 7-10 minutes. While waiting, make the dipping sauce by combining orange juice, honey, & spring onion. Season accordingly. 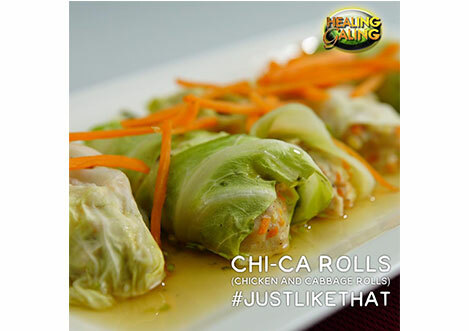 Serve in a rectangular plate and flood the rolls with the dipping sauce.